Singapore is sweltering its way through the monsoon. Heat and rain! 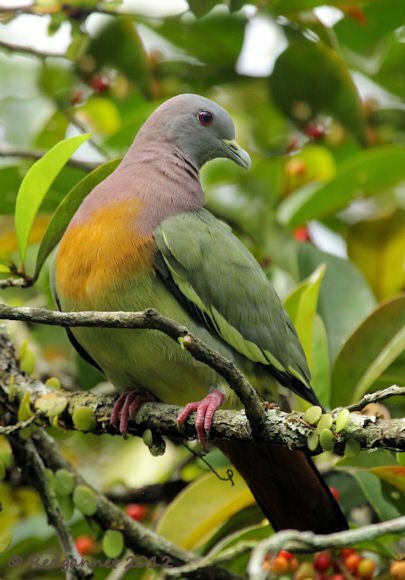 Western Palearctic constitutions were not designed for these conditions, but here be Pink-necked Green Pigeons! The forest of the Central Catchment Area is always a good place to find them, but they are common wherever there are fruiting trees. 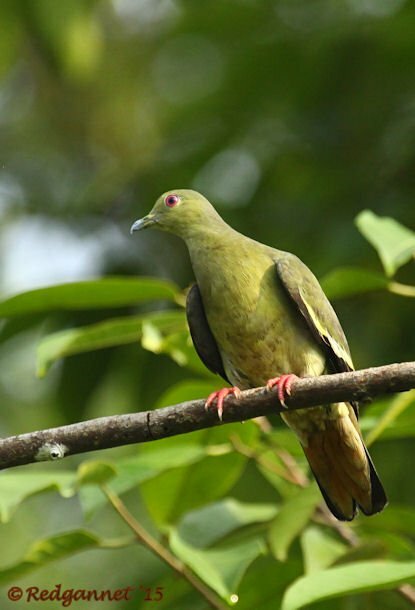 Now simply seeing green pigeons should be enough for anyone and if only the females show, then that is what you get, but the males include a pink neck and orange belly in their plumage to make a spectacle best observed at close quarters. 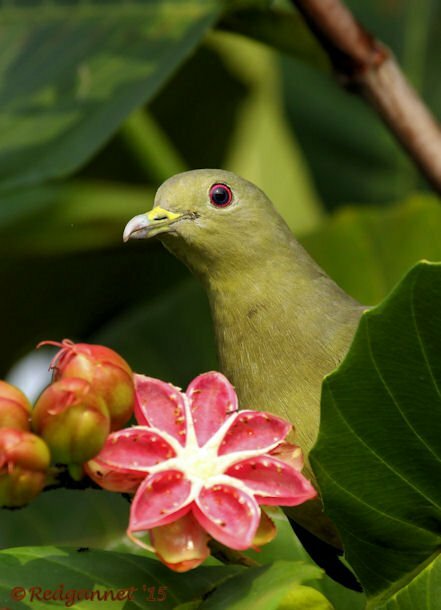 Most sightings are from underneath as the birds feed high in the trees or fly overhead. The colours are muted in silhouette, or observed just briefly through the leaves. Occasionally though, a fruiting tree will tempt them lower. 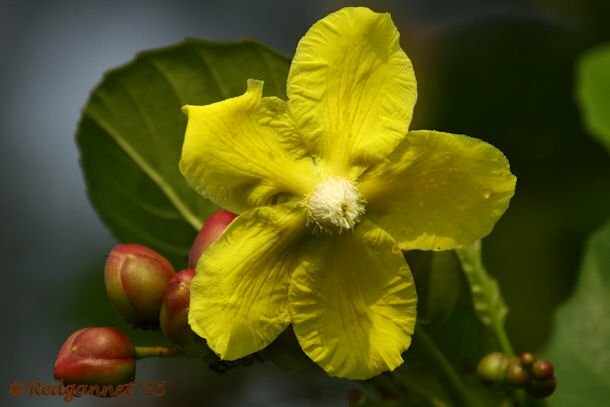 The females had found a Simpoh ayer (Dillenia suffruticosa), a common shrub which usually carries fruit and flowers at the same time. The lit side was also the soggy side, so enjoy these pictures as they cost me wet feet for the rest of the day. The males were feeding from other shrubs close by. The photo below was from a previous visit to the Botanical Gardens. 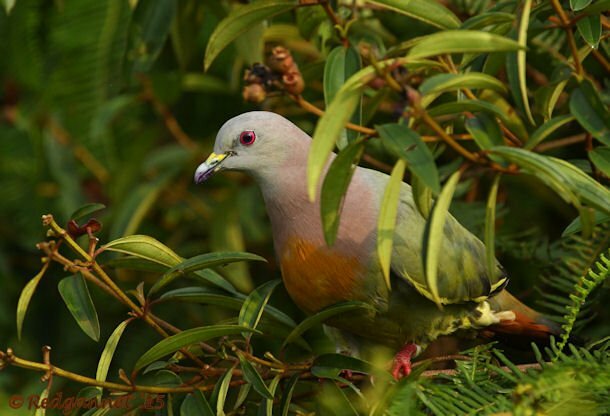 The pigeons in Asia and Africa are so much more spectacular than our North American species! Beautiful photos, Redgannet.